The city of London has long retained its own unique, architectural and design persona, with the centuries having shaped its winding streets and classic facades. 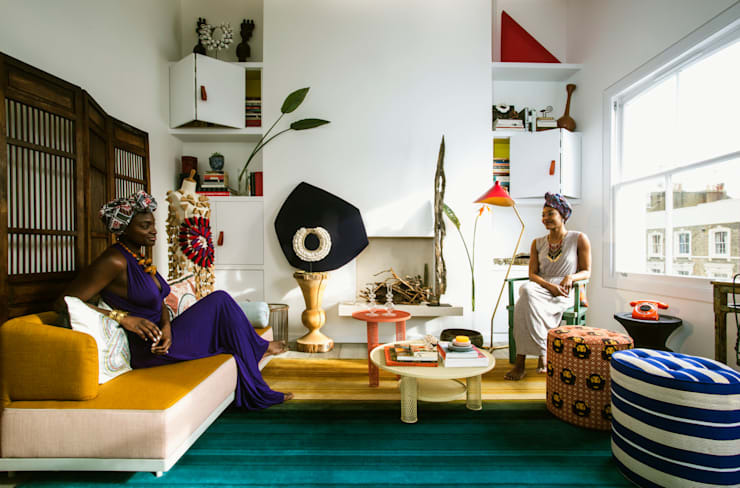 Within the confines of one small London apartment however, the creatives at Studio [D] Tale have designed a home that evokes all the colour and artistry of tropical Africa! 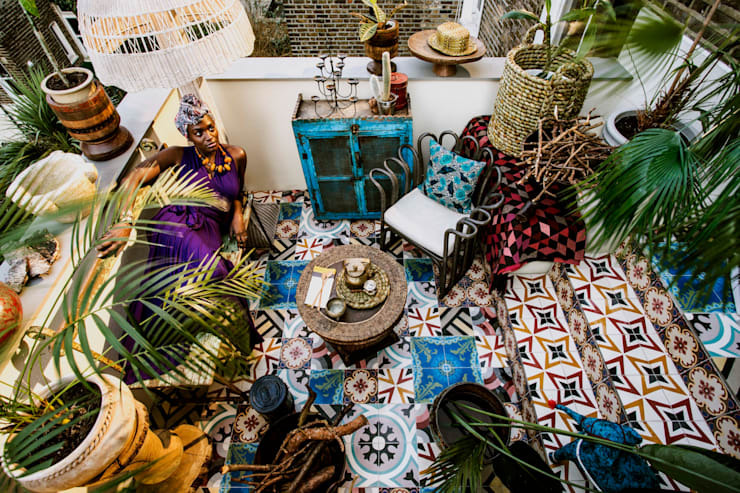 Traditional decorative objects with an African feel have been combined with vintage and contemporary furnishings for a sense of vibrant eclecticism, with striking colours and patterns included throughout the home to brighten and invigorate each room. The living room and kitchen have been designed with the classic combination of white walls and wooden flooring, then dressed up with African-style decorative elements, from colourful furnishings to traditional objects and artefacts. The bathroom is open and airy, with the sleek lines and finishes of its modern decor contrasting against vintage furnishings and bright tones. For the bedroom, the designers chose to create a softer space, with a light, flowing mosquito net draped across the comfortable bed, subtly subduing the vibrant colours of the bedspread and pillow cases. The crowning jewel of the apartment, however, is a brilliantly decorated balcony, which juts out from the side of the home in colourful, patterned eclecticism. The balcony presents the perfect space for small gatherings of close friends, with its surroundings sure to inspire lively interaction! The living room in the home oozes exotic, tropical style, with its combination of lofty, white walls and sleek, hard-wood floors spiced up by an array of African-inspired decorative objects. Bursts of colour, from the deep yellow of the contemporary sofa to the royal blue of a striped footstool, brighten the space, immediately endowing the room with its own unique persona. Traditional, cultural elements also abound, seen here in the sculptural, wooden artefacts displayed throughout the shelves on the far wall of the room. The classic facades of a London neighbourhood peer through a large window, constantly presenting a stylistic contrast between the character of this lively living room and its external, architectural surrounds. 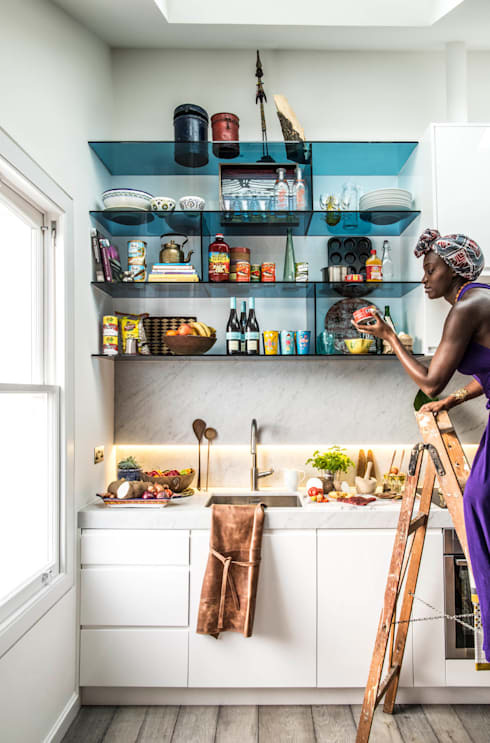 The home's kitchen is also characterised by lively colour and style, with the cool hue of translucent, blue shelving glowing within the space, lit by sunlight filtering through an adjacent window. An array of colourful ingredients and objects cascade down the shelves to the bench below, where fresh produce waits to embark on culinary adventures. The kitchen appears light and airy, with white predominating in the decor and a marble-finished splashback bordering the kitchen bench, adding a sense of understated luxury to the space. The bedroom of the home basks in soft, white tones which are variously warmed by colourful patterns. 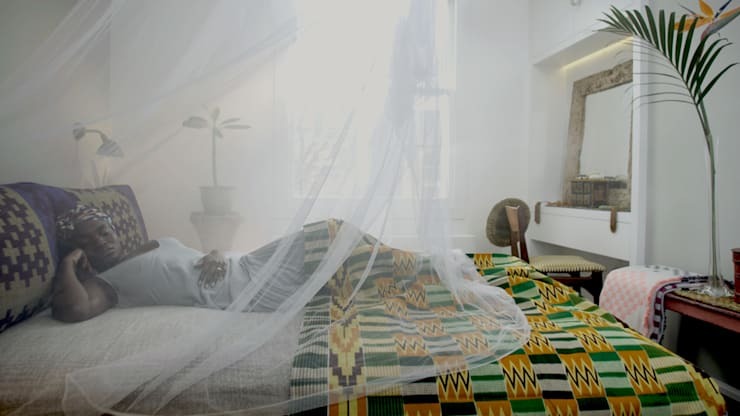 The large, comfortable bed seen here is brightened by the vibrant tones of its bedspread and pillow cases, while a soft, white mosquito net has been draped across the scene, playing playful homage to the African theme of the home's design. In the far corner a dressing space has been included, with a rustic, square mirror and beautiful, contemporary chair waiting to accommodate exotic beautification. Moving through to the bathroom and we can see that its open and light design has once again been dressed up with vibrant colours and bold patterns. The striking blue and white of the floor tiles draws the eye, presenting a playful and creative foundation on which to undertaken daily bathing rituals, and the contemporary design of the large shower unit appears sleek and sophisticated. A rain shower has been included in keeping with the tropical, African theme of the home's decoration, with the patterned hand towel and vintage wooden chair seen here also adding colour and character to the room. The crowning jewel of this beautiful home is undoubtedly its eclectic balcony, which streams out from the side of the apartment in colourful style. 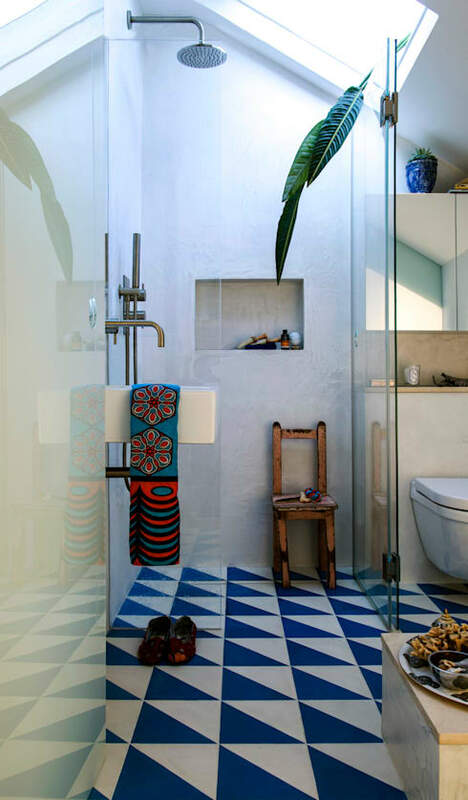 The tiled floor seen here instantly engages with lively, bold patterns, while a diverse array of African-style, decorative objects have been placed alongside leafy, potted palms, consolidating the home's overall design concept. Vintage furnishings such as the long, wooden bench and warm, blue cupboard contrast beautifully with the more modern design of the metal armchair and the sheen of the colourful tiles, adding to the sense of eclecticism within the space and augmenting its vibrant character. For more ideas to spice up your home's decoration have a look at The Inviting Artistic Villa and get inspired! Which is your favourite room in this striking, African-inspired home? Tell us below!